Archangel Michael Pendant Necklace For Strength And Protection. 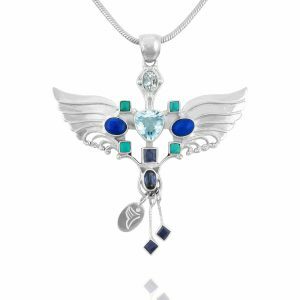 Archangel Michael Pendant is set with 6 different gemstones; Iolite, Topaz, Aquamarine, Kyanite, Turquoise, and Lapis Lazuli, which energetically support and magnify all Archangel Michael attributes and align our vibration more and more with his own. Archangel Michael symbolises victory, success, achievement and protection. He gives us confidence, and strength in our ability to overcome obstacles, deflect an antagonist, cut chords of dependance, and master all kinds of new skills. Archangel Michael`s purpose is to lead us to victory over those burdensome parts of ourselves which stand in the way of our growth and our capacity for happiness. co-dependence, and other controlling behaviours. 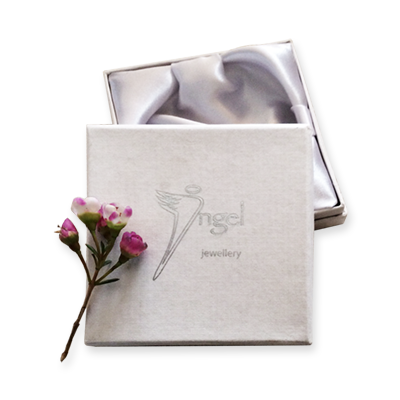 Wearing the Archangel Michael Pendant helps us create a sacred space, in which desired transformations can occur spontaneously. As we attune with his light and strength, captured in the symbolism and the crystals of the pendant we find the energy to overcome many of our problems. Archangel Michael can be called upon. Archangel Michael`s energy encourages us to be in touch with our feelings, be true to ourselves and our needs, to stand firm in our beliefs. When we need courage to leave behind harmful situations, old beliefs and dangerous behaviours we ask Archangel Michael to empower us to do what is right for our wellbeing and protection. His integrity is for the highest good for everyone. To this end he will be our most tireless supporter and protector. He is the guardian of all sacred truths. Take inventory of your schedule to make room for regular “me” time to keep you motivated and inspired.